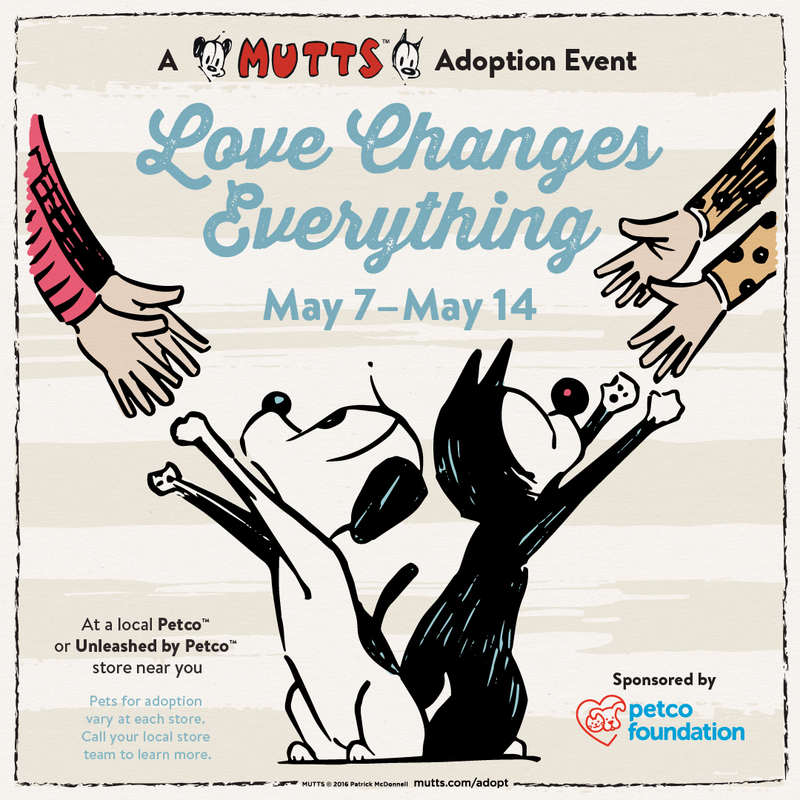 Pet Adoption News < On May 7th and 8th Find Love at Your Local Petco Store During the Mutts Adoption Event Weekend! On May 7th and 8th Find Love at Your Local Petco Store During the Mutts Adoption Event Weekend! Inspired by Patrick McDonnell’s heartwarming comic strip MUTTS featuring Mooch and Earl, the Mutts Adoption Event – brought to you by the Petco Foundation – celebrates the love that can change the world for pets without a home. And your life just might be changed too! During this national event, thousands of pets will be waiting for you at Petco and Unleashed by Petco stores across the country, waiting for a home… waiting for the love that will change their lives. Who knows—you might find your very own Mooch or Earl and fall in love! Why MUTTS in May? Recently award-winning artist and animal advocate Patrick McDonnell, creator of the MUTTS comic strip, turned a visit to New York City’s public open-admission animal shelter, Animal Care Centers of NYC, into a week’s worth of MUTTS comics called ‘Shelter Stories’. He focused on not just the animals in the shelter, but the selfless volunteers, the incredibly caring staff, and future pet parents that came in looking to fill their heart with love. Patrick captured the essence of love in not only the animal’s eyes, but also in their new pet parents and families hearts. Patrick’s journey is featured on Shelter Me, an inspiring series that celebrates shelter pets by telling positive and uplifting stories, proudly supported by the Petco Foundation. Check your local PBS station or visit shelterme.tv for airtimes then visit your Petco store to begin your own story. Cartoonist Patrick McDonnell’s Experience at New York City Animal Shelter Inspires his MUTTS comic strip, “Shelter Stories” from Steven Latham on Vimeo. The Petco Foundation believes love has the power to change everything. How has love changed you? Share your stories on Facebook and Twitter with the hashtag #lovechangeseverything!